The United Kingdom is preparing for the possibility of leaving the European Union without a plan in place. That would have immediate economic, social, and security repercussions. After nearly two years of negotiations with the European Union, Prime Minister Theresa May has been unable to persuade Parliament to pass her deal on the United Kingdom’s exit from the bloc. On January 29, lawmakers directed her to reopen Brexit talks with Brussels, even though the EU has ruled out further negotiations. But time is ticking down until March 29, when the UK is scheduled to leave the EU with or without an agreement. Why would a no-deal Brexit matter? Trade. Leaving without a deal would mean immediately leaving the common market, which guarantees that all of the UK’s trade with the rest of the EU faces no tariffs or regulatory checks. 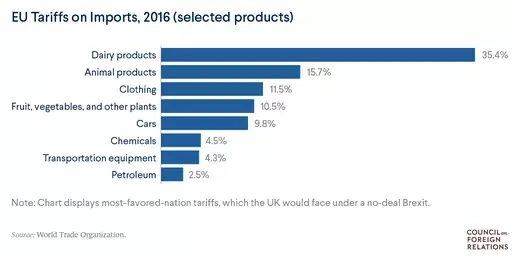 British exports to the EU would face most-favored-nation-level tariffs, which average just under 6 percent but are much higher on certain goods, especially agricultural products. There would also be new border checks for both exports and imports. This could result in higher prices, border backlogs and delays, and even shortages of staples, such as food and medicine. As the prospect of no deal has risen, some British companies have begun stockpiling goods. Investment. Several international firms have shifted their investments from Britain to elsewhere in the EU, fearful that supply chains will be disrupted. Aerospace giant Airbus is the latest prominent example, vowing to direct funds and jobs away from the UK in the event of no deal. Such moves could put tens of thousands of British jobs at risk. London’s role as a world finance leader could also be in jeopardy if financial firms relocate to the continent. Financial services provide 11 percent of the UK’s tax revenue; 44 percent of their exports go to the EU. Migration. 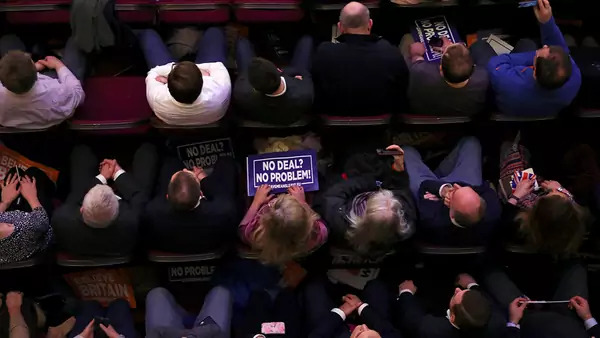 A no-deal Brexit will complicate the status of millions of EU citizens living legally in the UK, as well as that of British citizens in other EU countries. These figures are estimated at 3.6 million and 1.3 million people, respectively. Politicians have promised almost all will be granted “settled status” after Brexit, but anxiety remains. The Irish border. Without a deal, the border between Northern Ireland and the Republic of Ireland would immediately become an external EU border, requiring customs checks. This has become Brexit’s most contentious issue, as many worry a hard border could undermine the 1998 Good Friday Agreement and even revive conflict between Catholics and Protestants in Northern Ireland. Some officials also worry about potential security ramifications: U.S. Director of National Intelligence Dan Coats believes a no-deal Brexit would “substantially weaken” the UK, and a former head of British intelligence, Eliza Manningham-Buller, has argued the UK will be less equipped to handle terrorism and Russian aggression. UK police have warned that the loss of access to EU crime databases could undermine their efforts, but some proponents of Brexit argue these fears are overblown. Parliament wants May to renegotiate the Irish border arrangement with Brussels, but European leaders have rejected reopening talks. Another option is an extension of negotiations, which would require the approval of all EU governments. Meanwhile, some in Britain have advocated a second referendum, hoping to avoid Brexit altogether. Either way, as March 29 approaches without a parliamentary majority for any existing plan, it’s increasingly likely that the UK will crash out of Europe.